Known for his penetrating books on resilience and suffering, poet, philosopher, and cancer survivor Mark Nepo continues to go deeper into what matters and to sift the wisdom that comes from confronting and recovering from the physical and spiritual challenges of life. In Seven Thousand Ways to Listen, he offers new lessons and insights on the importance of giving our full attention to all that life has to offer. Mark Nepo has been called "one of the finest spiritual guides of our time", "a consummate storyteller", and "an eloquent spiritual teacher". With the rare ability to communicate stirringly profound truths directly to each individual heart, Mark inspires audiences of more than 15,000 people as well as small, intimate groups. 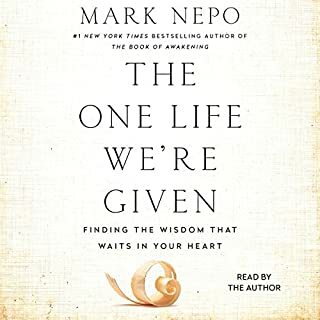 Now, in The One Life We're Given, Nepo's personal stories, questions, and meditations take us on a deep and uplifting journey to know our own hearts and enliven our souls. I see more clearly now. Thank you Mark! America has given birth to a wisdom tradition entirely its own, a spirituality that is as diverse as its people, and that respects the freedom and uniqueness of each individual. Judeo-Christian traditions and the meditation practices of Asia and India...modern science and Native American teachings...Sufism and transpersonal psychology - The New American Spirituality explores what happens when these and other traditions cohabitate our unique cultural landscape. At once a moving meditation and an empowering guide, More Together Than Alone is an compelling testament to the power of community and why it’s so essential in our lives, now more than ever. 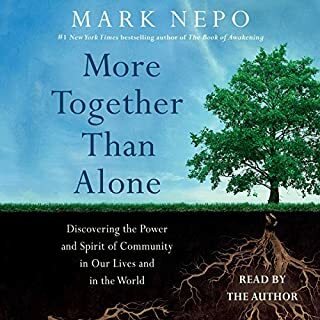 Mark Nepo draws from historical events, spiritual thought leaders, and the natural world to show how, in every generation, our tendency is to join together to accomplish our greatest achievements, from creating education to providing clean drinking water, and preserving the arts. In A Return to Love, Marianne Williamson shares her reflections on A Course in Miracles and her insights on the application of love in the search for inner peace. Paulo Coelho's enchanting novel has inspired a devoted following around the world. This story, dazzling in its simplicity and wisdom, is about an Andalusian shepherd boy named Santiago who travels from his homeland in Spain to the Egyptian desert in search of treasure buried in the Pyramids. Along the way he meets a Gypsy woman, a man who calls himself king, and an Alchemist, all of whom point Santiago in the direction of his quest. Most of us can remember a time when we felt completely awake - fully present, deeply engaged, our heart and mind wide open. We also know those periods of sleepiness when our purpose is unclear, we lose our way in relationship, and life's challenges seem more than we can bear. 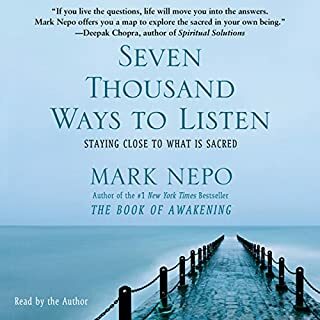 In Staying Awake, Mark Nepo invites us to inhabit our tuest selves "in all ways in all directions," as we find our own voices in the One Conversation in which each of our lives is a story waiting to be told. As a poet, philosopher, and cancer survivor, Mark Nepo has been breaking a path of spiritual inquiry for more than thirty years. In his new book, the #1 New York Times bestselling author explores how the soul works in the world. Called "one of the finest spiritual guides of our time", this beloved teacher explores what it means to become our truest self through the ongoing and timeless journey of awakening to the dynamic wholeness of life, which is messy and unpredictable. On Reduced to Joy, best-selling author and poet-philosopher Mark Nepo invites you to join him in a poignant examination of "the gifts and challenges of being a spirit here on Earth," through six captivating sessions that address the vital task of discovering and returning to what matters. Gave me many doses of just what I needed to hear..
A daily guide for authentic living in hard times, The Book of Awakening is a book to keep your head high, your heart open, and your feet on the ground. “It is true,” Nepo writes, “If you can’t see what you’re looking for, see what’s there. It is enough". I wish someone besides the author were performing. Yes, it's time well spent...though I wish I were reading it instead of listening to it. What other book might you compare The Book of Awakening to and why? Reminded me a bit of a daily wisdom book I like by Hugh Prather. Who would you have cast as narrator instead of Mark Nepo? Anyone who could make it sound more conversational. His delivery is so Jack Handy on a sugar buzz I have a hard time actually hearing what he's saying. I wish I'd bought the book to read instead of listen. Did The Book of Awakening inspire you to do anything? Yes. It is well written, full of wisdom. I am not sure what I was expecting from this audiobook but it certainly wasn't what I found... I started listening to it and after the first 10 minutes I was about to turn the thing off and write this purchase off. I am so glad I didn't!! I stuck to it and found... revelation! Every day a story, a quote, a fable... every day the going deeper into the meaning of those... and every day a message, a lesson, a knowledge that cuts through the barriers and goes straight to your heart. 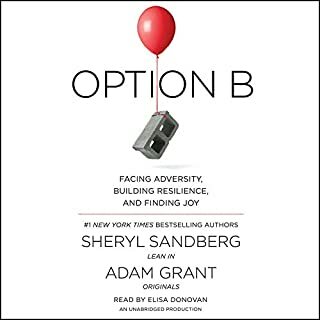 There are so many jewels in this audio book! They are small and clear and bright... things that, after you listen to them, you know you already knew them but for some reason you were never aware of the knowing. Beautifully narrated by the author and so inspirational that temporarily made a poet out of me. I really recommend this book! Would you try another book from Mark Nepo and/or Mark Nepo? No, not an audible book read by the author. NO! Has The Book of Awakening turned you off from other books in this genre? No...it is because I read mostly within this genre that I chose this book. He reads like a poet. It's less about awakening and more about a poetic sensibility on the subject.Not my cup of tea. Yes. I am inspired to buy no more 'read by the author' Mark Nepo books. 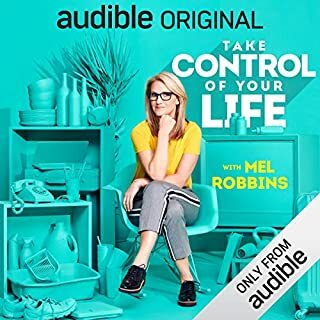 This is one of the least interesting audible reads I've experienced in my 5 years on Audible and my 250+ books purchased. LEAST! Mark Nepo has written a book that I have enjoyed every day for a year. The inspirations provided through his observations and meditations are timeless and timely. I plan on re-listening through the next year. The narrator is soooooo lethargic. I did not know whether to fall asleep or jump off a bridge. I rushed through it, listening to 4-5 everyday while walking my dogs. 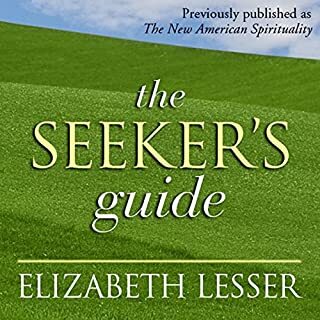 I now plan to start over and listen to the daily one as I start my meditation (of which will be new to me) This book opened my mind, and spirit to so many things overlooked otherwise. 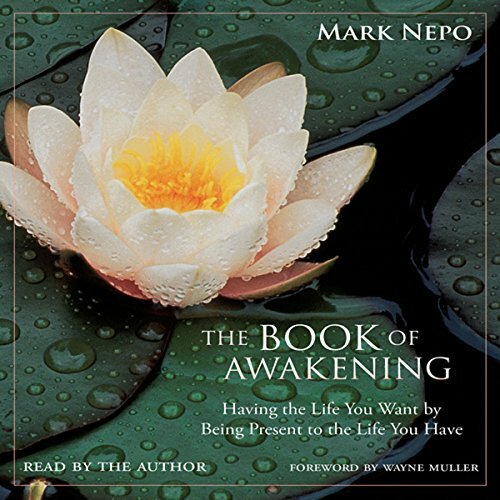 I really appreciate the hard won wisdom Mark Nepo shares in this book, and the way he helps us absorb it. His teachings and reflections are like a meditation helping to ground us and connect us to our deeper truths. I recommend reading this one entry each day rather than straight through. This gives you a chance to digest a lesson at a time, giving each seed the best chance to take root in you. I have used this book for my daily inspiration for several years and will continue that practice into the new year. You would think 5 years of membership would garner the convenience of listening to my books on Audible as I always have, but alas my downloads are gone. I received a message that I need to try and re-download the books at the high-quality download. My question is, where are my previous downloads and why can I not still listen to them.